beyerdynamic Orbis: the new champion in the "ring"
beyerdynamic, the well known German audio specialists presents a new wired conference system named Orbis (Latin for circle). Orbis is being presented officially for the first time at InfoComm 2014 in Las Vegas and represents a combination of modern technical features and outstanding high quality audio. During the development phase particular attention was paid to making this digital system easy to manage. As the successor of beyerdynamic’s wired conference solutions MCS 20 and MCS 50, Orbis is designed for use wherever discussions are to be held requiring the highest possible speech intelligibility. The central control unit and the microphone units are wired to each other using standard Cat5 cables. The closed ring simultaneously supplies the microphone units from both sides with uncompressed digital audio signals and voltage. Orbis is ready for operation as soon as it is connected without requiring complicated software configuration. Orbis features high quality materials and modern design that has been created especially to satisfy difficult requirements. Features such as silicone push-buttons with multi-colour backlighting and tactile feedback, as well as a headphone connector or an induction loop for assisted listening, meet the requirements of the UN Convention on the Rights of Persons with Disabilities. 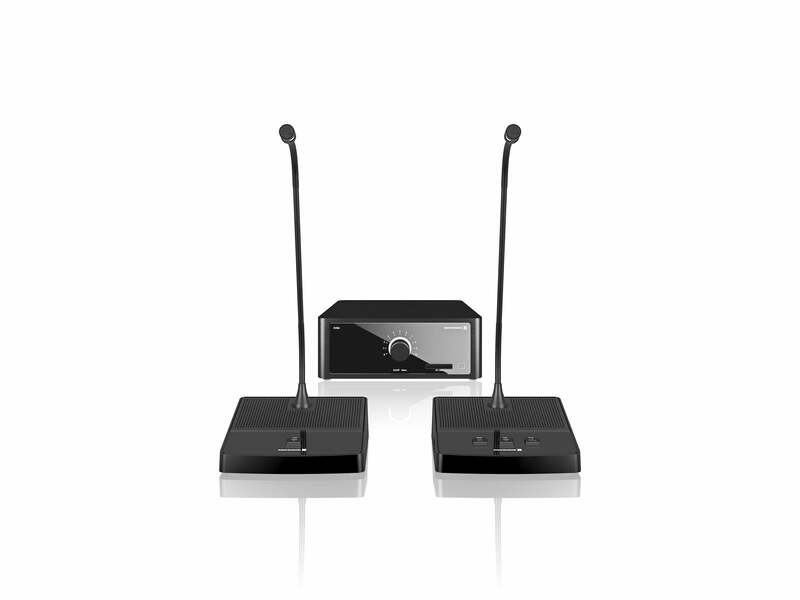 The microphone units are available in a variety of fitted or desk-top versions, and enable the system to be integrated individually, elegantly and discreetly into any conference set-up. The heard of the system is the desktop central control unit which can also be integrated into an AV rack. ThThanks to its one-button navigation, the clearly structured user interface can be operated intuitively. The backlit display visualizes the operating modes, which means branching into sub-menus is not necessary. With the hot plugging feature, additional microphone units can be connected during a conference without causing any interruption; the system automatically identifies all additions or replacements. Up to 100 microphone units can be operated from one central control unit. If the system is connected in a loop for a redundant operation, up to 50 microphone units can be connected to the central control unit. Orbis achieves its impressive system capacity by means of particularly economical microphone units that consume less than 1 watt per unit at maximum volume. The central control unit only requires 1.5 watts in stand-by mode. beyerdynamic remained committed to environment-friendly processes when manufacturing Orbis. The RS-232 interface in the Orbis central control unit allows the system to be connected to a media control unit making operation and control of the conference system particularly convenient. Orbis is highly flexible because microphone signals can be transmitted via different outputs. The system can be used for a variety of applications, such as telephone and video conferencing, or for including a foreign language channel. Thanks to the integrated recorder each meeting can be recorded without the need for external equipment. The digital audio recording is saved on an SD card that is inserted into a slot on the central control unit. The chairman and delegate microphone units are coated with a special paint that was specially developed for the automotive industry and is particularly hard wearing and scratch resistant. The operating panel is made of hardened acrylic material. The practical cabling options allow the cables to be connected from below or behind depending on the conditions on site. Strain relief is provided for these cables. Pre-drilled holes allows the microphone units to be affixed to the table if required. The gooseneck microphones are available in four different lengths and, if needed, can be replaced quickly thanks to the robust XLR connector. beyerdynamic’s Scudio technology reliably eliminates interference caused by mobile phones. Intelligent construction of the microphone unit housing ensures that it does not slip when set up on a table top. Vibration transmission is reduced effectively further improving signal quality. A unique feature of the Orbis system is its inlay panels which can be tailored to the customer’s requirements in terms of color, material and push button labelling. Orbis can be used wherever an easy-to-use wired conference system with optimum speech intelligibility and useful features is required. Rock-solid, made-in-Germany build quality guarantees the durability of all the components and the reliability of operation in hectic conference environments. Thanks to its numerous customization options and attractive design, Orbis is the optimum solution for a wide range of demanding applications. Publication free of charge – Copy requested.